Why is it a Great Gift ? : Gift baskets are excellent choices when you are not sure what to send. Packed with all kind of gourmet delights, they are ideal for most occasions. Tastefully decorated, they will be a gift your loved ones will cherish and r'ber for a long time. Filled with special birthday surprises, this one-of-a-kind basket is the perfect birthday gift for all ages. 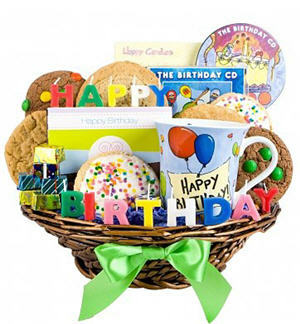 A willow basket holds a set of Happy Birthday candles, a porcelain mug decorated with birthday balloons inside and out, and a fun CD of birthday music containing over 50 unique birthday songs. We also include Milk Chocolate Stars and fresh baked cookies in the delicious flavors of Snickerdoodle, Chocolate Chip, Vanilla Frosted, Fudge Rainbow, Lemon Tea, and Peanut Butter. Measures 16 x 14 x 6.